Udon Noodles - made with soft wheat, they acquire a smooth chewy texture. 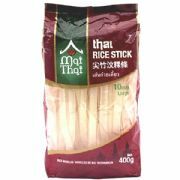 This pack contains 3 individually packed portions of pre-cooked noodles which simply need heating through in boiling water for 2-3 minutes before serving. Alternatively these udon noodles may stir fried in a little oil with cooked meat and vegetables. 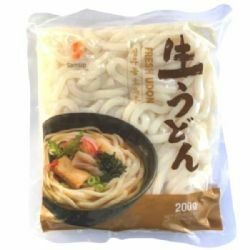 Udon noodles are traditionally from the south of Japan in the Osaka region and have been popular in Japan since the 14th Century. Udon are also widely used in Korean cooking. Ingredients: Wheat Flour, thickener E1442, Salt, acidity regulator (E575, E350, E325, E270, E260, E296), Water.